North Korea has tested a new intercontinental ballistic missile that could hit the continental United States. Combined with Pyongyang’s miniaturized nuclear warheads — which many analysts believe North Korea already possesses — Kim Jong Un’s regime now has the ability to unleash nuclear Armageddon on the American homeland. That means America’s policymakers must make a decision — either live with a nuclear-armed North Korea or launch a military response. There is little prospect of coaxing North Korea to give up its nuclear weapons program. The Pentagon is already discussing a military response to the North Korean test. “Subsequent to the North Korean intercontinental ballistic missile (ICBM) launch today, Chairman of the Joint Chiefs of Staff, General Joseph F. Dunford, Jr., and Commander, U.S. Pacific Command, Admiral Harry Harris called the Republic of Korea Joint Chiefs of Staff Chairman, General Lee Sun Jin,” reads a statement from the Joint Chiefs of Staff. According to David Wright of the Union of Concerned Scientists, the North Korean weapon could easily hit the United States. “It appears the ground range of the test was around 1,000 km, which put it in or close to Japanese territorial waters. Reports also say the maximum altitude of the launch was 3,700 km (2,300 miles) with a flight time of about 47 minutes,” Wright wrote. Indeed, by Wright’s calculation, most of America’s largest cities are well within the range of the North Korean missile. However, Washington D.C. is probably just outside of Pyongyang’s reach. “Los Angeles, Denver, Chicago appear to be well within range of this missile, and that Boston and New York may be just within range,” Wright wrote. The one caveat is that it is not known what the North Korean missile was carrying in terms of payload. It is possible that the weapon’s operational range is shorter. “It is important to keep in mind that we do not know what payload the missile carried on this test,” Wright wrote. 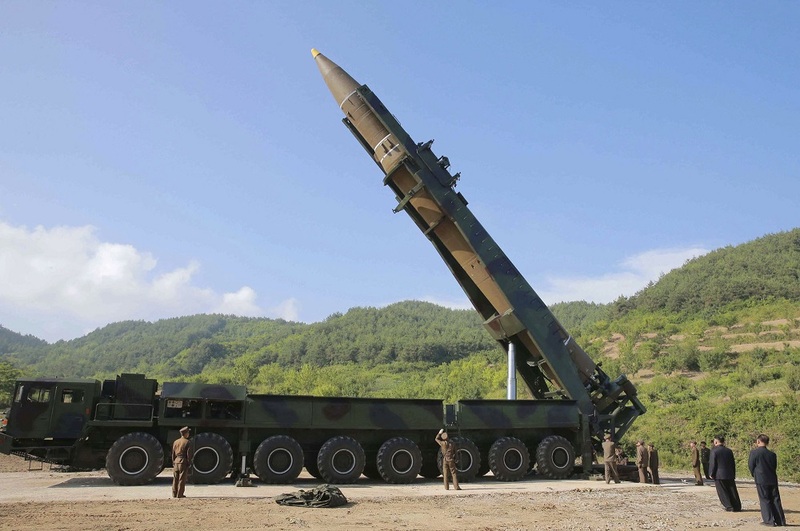 While there is some doubt as to whether the North Koreans have a miniaturized warhead that can fit atop their ICBM, arms control and missile expert Jeffrey Lewis said that Pyongyang claims to have tested such a device. “They claim they tested it in September. I believe them,” Lewis wrote in a tweet. The problem for the United States is further compounded by the fact that there is nothing in the Pentagon’s inventory that can shoot down an ICBM flying on this particular trajectory. “We don’t have anything that could engage that class of target on that trajectory,” Lewis noted. U.S. Army chief of staff Gen. Mark A. Milley told an audience at the National Press Club in Washington that the United States faces an imminent choice on what it must do to address the North Korean problem. 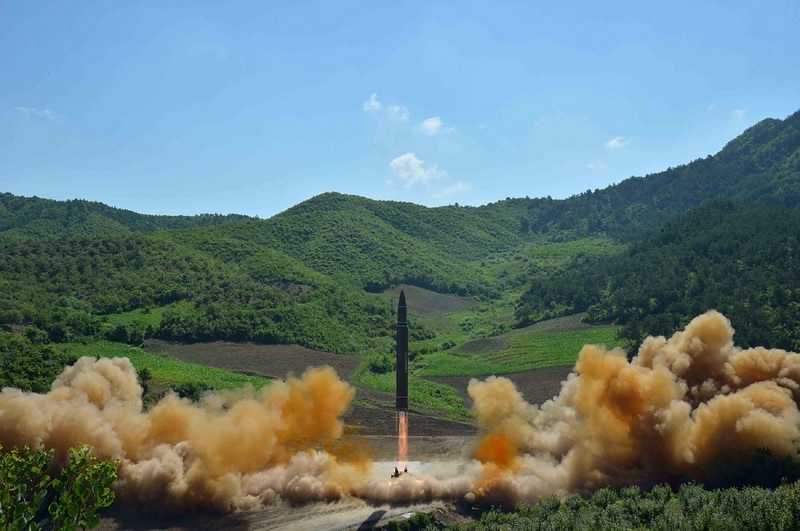 Milley noted that none of the options facing Washington are good because Pyongyang’s nuclear weapons and ICBM programs are advancing faster than even the most pessimistic projections. “We are at a point in time when choices will have to be made one way or the other, none of these choices are particularly palatable,” Milley said. Lewis noted that the only realistic policy option for the United States is to “be deterred” — though the Pentagon is contemplating a military response. If the situation on the Korean peninsula devolves into open warfare, the United States and South Korea would undoubtedly destroy North Korea’s military. But the cost would be extremely high, particularly for the civilian population in Seoul and other large cities in the region. Ultimately, there is little Washington can do other than to live with a nuclear-armed North Korea. Pyongyang has little incentive to give up what it sees as its trump card to ensure the survival of the Kim regime. “Only an atomic bomb offers certain deterrence against the overwhelming military power of populous and prosperous South Korea backed by the U.S. superpower,” Doug Bandow, a senior fellow at the Cato Institute wrote for The National Interest. Indeed, when the United States helped to overthrow Muammar Gaddafi in 2011 after the Libyan dictator had agreed to give up his weapons of mass destruction, Pyongyang became even more determined to hold onto its nuclear weapons. Essentially, North Korea made the simple realist calculus that a weapon that might deter the United States and preserve the regime overrides any economic or diplomatic benefit, such as a security guarantee. “Libya’s nuclear dismantlement much touted by the U.S. in the past turned out to be a mode of aggression whereby the latter coaxed the former with such sweet words as ‘guarantee of security’ and ‘improvement of relations’ to disarm and then swallowed it up by force,” the North Korean Foreign Ministry stated at the time — denouncing negotiations as a prelude to disarm the regime prior to an invasion. It is likely — unless Pres. Donald Trump is willing to launch a preemptive strike on North Korea — that the United States will just have to adjust to the reality of a nuclear-armed Pyongyang. Such a move would not be unprecedented. While the United States used to state prior to August 1949 that a nuclear-armed Soviet Union was unacceptable, subsequent to Moscow acquiring an atomic bomb, Washington quickly learned to accommodate the Kremlin.